I’ve maintained the Yaesu FT100 FAQ for about 10 years. For those of you not familiar with ham radio, the FT100 is a popular mobile transceiver. I’ve talked to people from all over the world on it. As time went on, the FAQ stabilized and I rarely have to do much updating to it now other than to fix broken links. This FAQ still sees a fair amount of traffic. My FT100 is mounted in my Durango using a YSK100 separation kit. The separation kit makes this radio easier to mount in a vehicle by separating the user controls, called the ‘head’, from larger body of the radio. The head then can be installed on a faceplate that is connected to the radio’s body with long cables. The body of the radio can be installed wherever you find room in the vehicle. Mine is hidden in the center console. About a year ago, the latch that holds the head on to the face plate of the YSK-100 separation kit broke while I was removing the head. 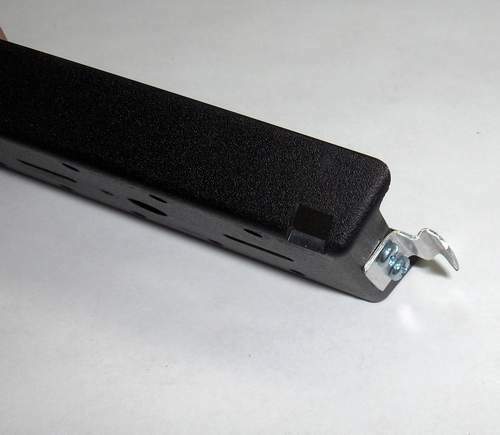 I’ve never been happy with the YSK100 faceplate design since the latch requires an excessive amount of force to deflect when installing or removing the head. Without the latch, the radio could still be used, but it would fall off easily whenever I brushed against the head. Since the radio has been out of production for a few years, spare parts hare hard to find. So I decided to fix it myself. The plastic latch had cracked off of my faceplate. There had been several reports of this problem on the FT100 Yahoo Group, but no one had ever reported figuring out a fix for it. You can’t just glue it back in place, because the part is highly stressed and a glue joint would not hold up to those extreme forces. 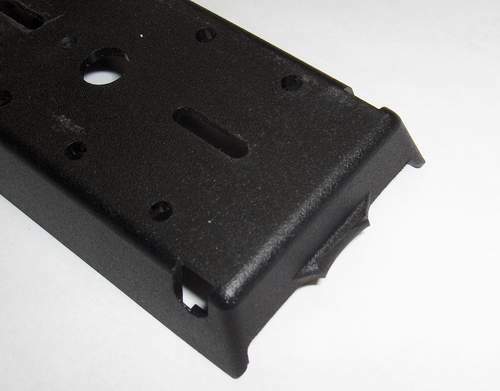 As you can see in the above image, a small portion of the latch is still on the wall of the faceplate. I sanded this off with a small belt sander. Next I took some measurements and started bending some .032″ thick aluminum sheet metal to make my own latch. I have a small metal brake/shear, but in this case, I just ended up using a vice to bend the sheet metal since the brake has a limit on how small the bends can be. I drilled some small holes and with attached it with M3 screws and nuts. 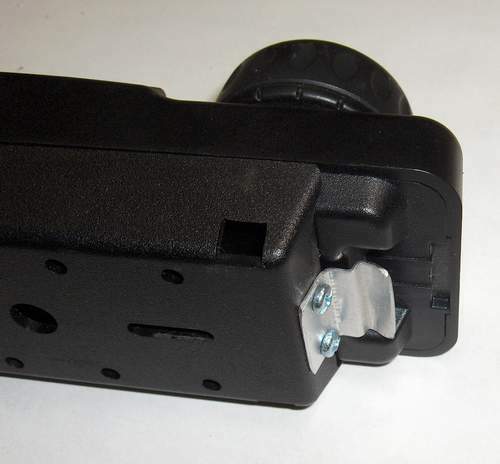 Here is a top view of the latch. It works pretty much like the old latch in that it’s very stiff and holds with a lot of force. I suppose a thinner material, perhaps a lighter gauge steel, might have worked better, but this one can be bent to get the desired feel. If it ever breaks again, I know how to make a new one. 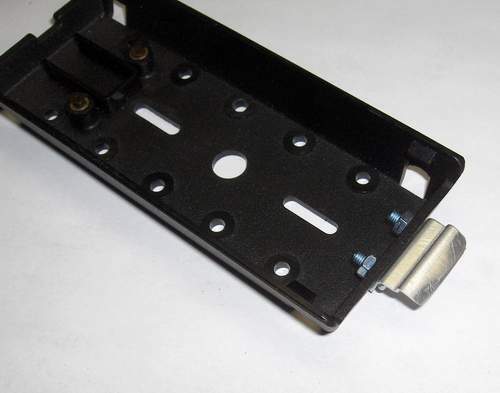 Here is a side view of the latch. New metal latch with head installed. Now that the radio is fixed, I plan to spend more time using it. When it was in that state of falling off the faceplate whenever I touched it, I frequently removed it all together and stowed it so it wouldn’t get damaged. But now I’m looking forward to having a properly functioning radio again. I tend to avoid using something that doesn’t work the way I want it to and then when I get around to fixing it, I wonder why I didn’t do it sooner. 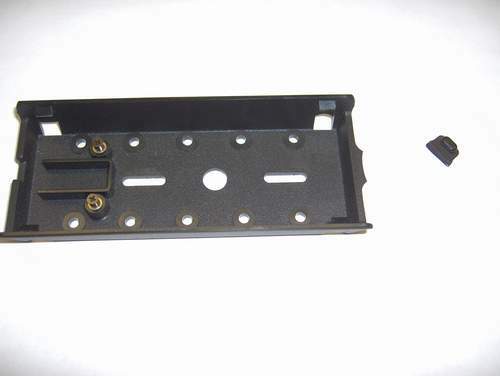 I hope that others are able to take advantage of my description and pictures to help them to fabricate their own latch in the event that they break the plastic one that comes on the faceplate. UPDATE 2013-01-13: This was the first blog entry I ever made. It was over 11 years ago when I first wrote this and I just wanted to go back and add this comment to it. I was using Blogger at the time. Over the past year, I’ve added permanent APRS trackers to my car and plane. After a few experiments on my bicycle, I found that it was impractical since it was too hard to hit the repeater. I’ve been trying to get my APRS tracker up and running and so I spent a lot of time on the Internet looking for ideas and help. My goal is to have a tracker for all of my vehicles which includes my LongEZ, Durango, and even my bicycle. It would be nice if the trackers would come on automatically so I’m not even aware of them. That wouldn’t necessarily be the case on the bicycle, of course, since I’d like to use the same radio to talk when I’m not beaconing out my coordinates. But I’d like to keep the FT100 free in the Durango so I’ll have to find another radio to do the transmitting on the APRS frequency. In the case of the bicycle I’ll have to splice in a headset and PTT for that setup. I’m thinking of using the FT50 handheld in the plane and the bicycle. The GPS in the plane is a Garmin XL95 and it’s always installed, so I’ll use that as the positional data source. I have a Garmin eMap for the bicycle along with a handlebar mount for it. Getting the connectors has been a real pain. I found the Garmin connector in an unlikely place and it looks like the elusive 4 ring plug for the FT50 is available from Mouser (just look for p/n 171-7435).